Can You Trust Walmart's 'Made in USA' Product Claims? For many Americans, a "Made in USA" label can often mean the difference between buying an item, or putting it back on the shelf. 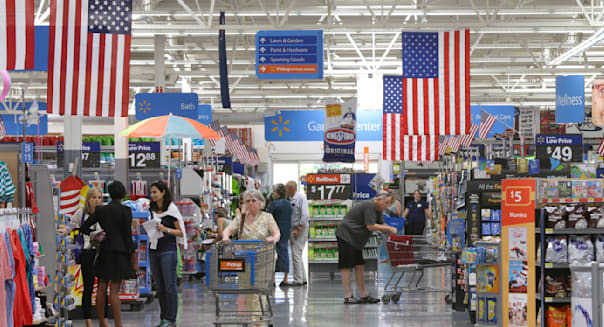 Advertising watchdog group Truth In Advertising alleges that Walmart mislabeled more than 100 items as "Made in the USA" on its website, when the products were actually made in China or other countries. Other products claiming U.S. origin only contained a percentage of USA-made components, or were assembled -- not made -- in the United States, the organization says. Truth In Advertising said it sent Walmart a letter detailing the "false and deceptive" label findings. The June 22 letter specifically mentions Walmart's Equate store-brand makeup sponges, which it advertises on its website as "Made in the USA," even though the product packaging states the sponges were "Made in China." "False made in USA labeling on Walmart's website has misled consumers looking to purchase American-made products," Trust In Advertising executive director Bonnie Patten said in a statement. "The largest retailer in the world should have made sure its American-made claims were accurate before affixing made in USA labels on the products. Until Walmart cleans up this mess, consumers cannot rely on Walmart with regard to where a product is really made when shopping on the site." We are continually working to improve our website listings and information. We are undertaking a more extensive quality assurance review to help eliminate these coding errors. Based on our initial internal review, we believe these errors are limited to a small percentage of items and we are confident in the overall integrity of the information on our website. What makes this issue even more interesting is that Walmart has committed to buying $250 billion in U.S.-made goods in an effort to "create more American jobs by supporting more American manufacturing." "It's incredibly disingenuous for Walmart to be promoting their initiative to stock $250 billion [in] American-made products while at the same time they are in violation of FTC labeling standards for what qualifies as made in the USA," said Michelle Amazeen, assistant professor of advertising at New Jersey's Rider University. According to the FTC, products that are promoted as U.S.-made must meet the "all or virtually all" standard. Typically, the FTC must receive a formal complaint from an outside party about a product's questionable U.S.-origin claim before it investigates the potential fraud, Consumer Reports explains. "Given the vagaries of 'Made in the USA' labeling," CR said, consumers should be on the lookout for a product's "Country of Origin" mark, which Customs and Border Protection require on all imported products. "It must be in a conspicuous place where it can be seen with casual handling, so you should be able to find it easily while shopping in a store," CR added. You can report questionable U.S.-made product claims by filing a complaint with the FTC or calling 877-382-4357. What are your thoughts on this alleged mislabeling? Are you more likely to purchase a product that has a "Made in USA" label? Share your comments below or on our Facebook page.